Across 13 years of hosting the Presentation Summit, we have offered up over 800 individual topics for exploration, learning, and discussion. But nothing is quite like the makeover, several of which we conduct each year in one form or another. The presentation makeover is, at the same time, inspiring and discouraging, riveting and risky, insightful and intimidating. That’s quite a topic that can evoke such a range of reactions and emotions. On June 15, I host a webinar for PresentationXpert entitled Marvelous Makeovers and you are invited to attend at no cost. On its eve, I think it appropriate to explore why presentation makeovers interest us all so much. I don’t perform makeovers unless the original creators are present and that adds a whole layer of complication to the dynamic. It would be mildly entertaining, in a train wreck sort of way, if I showed ugly slides, trashed them mercilessly, and then heroically saved them from further public shaming. Mildly entertaining, but cowardly. It is crucial to first acknowledge that nobody sets out to create awful slides and dreadful presentations. Everyone has the best of intentions, but the odds are stacked against us: most people are undertrained in PowerPoint, lack a professional background in design, and are scared beyond death to speak in public. No wonder people find presentation so difficult. So it is not hard to understand why people would take my comments personally, seeing how much of their own person they put into their slides. I have to be gentle, but not boring. Diplomatic, yet pragmatic. Appreciative of the intelligence that went into the effort, while mindful of the room for improvement. Above all, I need to balance all of these sensitivities with the recognition that the authors themselves found the slides to be deficient or they wouldn’t have sent them to me in the first place. And that is where any good makeover begins: Why did you send your slides to me? What’s wrong with them? In what way are they not performing to potential for you? You might think that to be a cop-out; isn’t it my job to tell them what’s wrong with them? Isn’t it cheating for me to ask them first? In a word, no. This isn’t a Vegas-style magic show we’re talking about here. I won’t be pulling cards from a deck or rabbits from a hat. Little good can come from a makeover if I don’t first know what the author’s intentions are; what the purpose is for the slides; what type of presentation the slides were designed to complement. 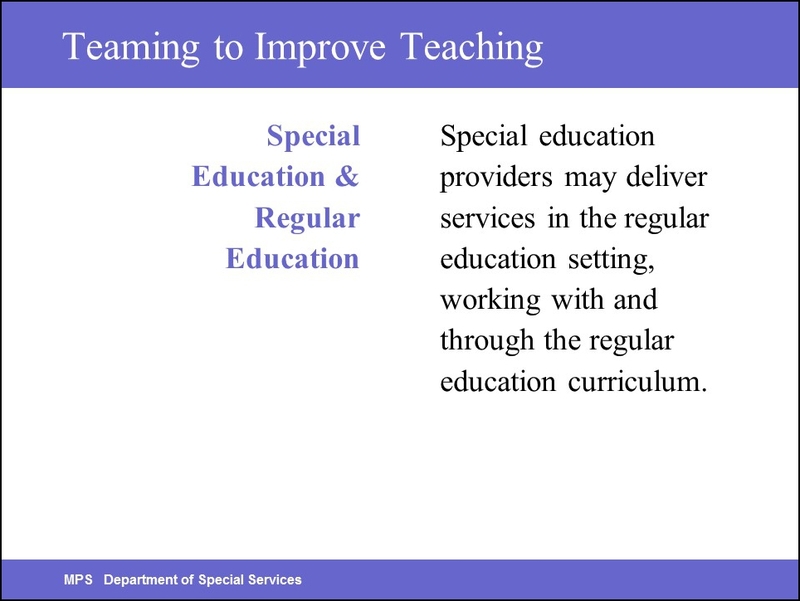 Case in point, the slide here about teaching special ed. students. Is this a wonderfully-clean slide or a horribly-verbose one? Without knowing the audience and the medium, you’d just be guessing. On the one hand, I love the white space, the clean lines, and the consistency of the elements (this was one of 10 slides and they all honored consistent margins and boundaries). It is not boring old PowerPoint-ish use of titles and bullets, and the accent blue is nicely matched between the subtitle and header and footer strips. On the other hand, there sure is a lot of text on this slide. Who is going to read that block of text? And if the presenter is reading it out loud while audience members are reading it to themselves, you have instant Death by PowerPoint. That is a huge disconnect waiting to happen! Aha! In context, I now see that the nice clean design is a success and the fully-formed paragraph is a success. And yet this slide failed because it was not designed with self navigation in mind. The simple makeover makes use of PowerPoint’s slide numbering (one of the few times in which I find value in numbering slides) and its system of hyperlinks to create website-like navigation. All this slide needed was some bread crumbs so audience members could navigate it on their own. That is all this slide needed! One of the simplest makeovers on record. One of the more egregious examples of misplaced good intentions is when presentation designers want to make use of humor and think that the slide itself should be able to accomplish that. For a presentation all about grammar, this instructor thought it might be nice if the slides were a bit playful. The flying saucers and rocket ships that you see were all animated with Fly Ins, Spins, and Fly Outs, and the sound effects were that kind of spooky, hovering sound that we all seem to believe extraterrestrial ships make. If the slide is too funny, how can the presenter be? The examples that the instructor had for these grammar boo-boos were quite funny (“I bought a tire from an auto shop that flattened overnight.”) But after groaning over this section slide (or trying really hard to politely not groan), audience members were not in the right frame of mind to receive the humor. It should never be the job of the slide to impart humor, sadness, joy, or sorrow. That gives it way too much importance. It is your job, as the presenter, to make the audience feel those things. 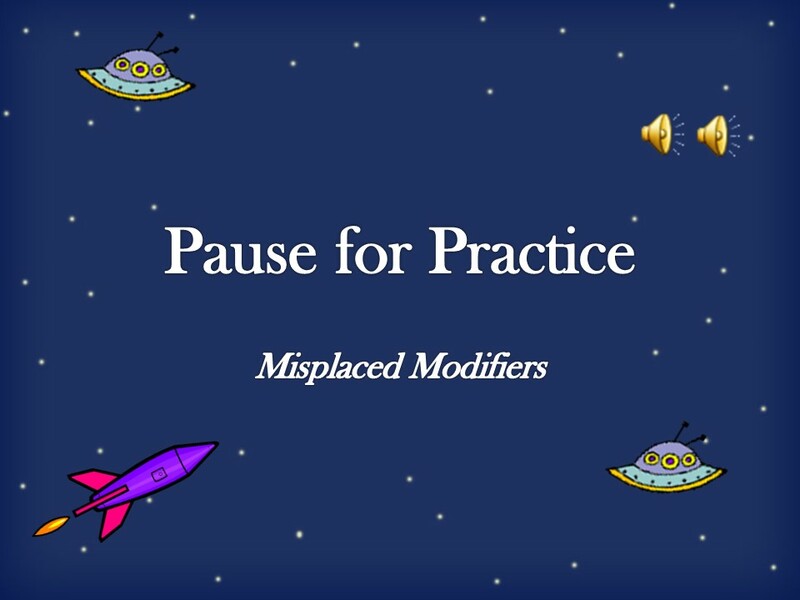 Our makeover for this slide was nothing more than a celebration of the letters that make up the words that make up grammar, and a light play on the television show that was very popular at the time. This slide’s job is to sit back and let the presenter be funny. It’s great to have attractive slides, but first we must concern ourselves with the message, the story, the overall narrative arc of our presentation. Once we understand that, creating nice-looking slides is much easier. And makeovers are more productive. Rick Altman’s Marvelous Makeovers makeover webinar takes place on Wed, Jul 15, 11:00a PDT / 2:00p EDT. Visit PresentationXpert’s webinar registration page to attend at no cost. Thanks Rick — I look forward to watching your webinar. 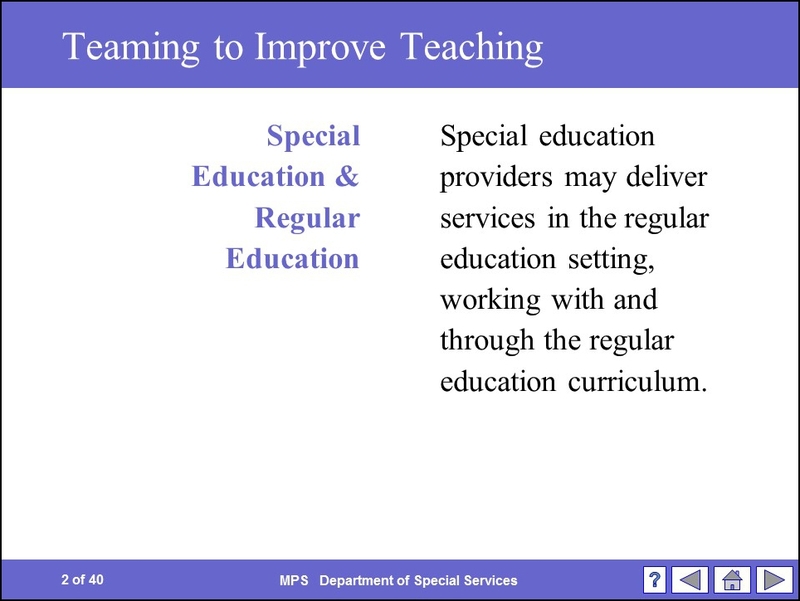 With the special-ed slide, I noticed the line lengths are extremely short for the font size. So only 1 or 2 words fit on some lines, which makes reading harder. If the slide’s only a foot or two from the reader’s face, I’d be tempted to shrink the text so more words fitted on each line. Also, a sans serif font might look more modern and in keeping — if the slide’s creator agreed to it! I really like the UFO makeover though. The lovely pastel colour for the background letters mutes them beautifully. You might be interested in this 2-part makeover I did on a slide that a speaker might use to introduce themselves (showing their name, photo and job title). Would love to hear your viewpoint.